The choice of transportation sets the stage for whether your event will be a big hit as it is the first thing your attendees see. There are a ton of transportation options, but one transportation option that stands out in New York are charter trolleys. Charter buses are the best transportation options for events and outings such as concerts, bachelorette parties, rehearsal dinners, family reunions, school trips, and other excursions. There are a few trolley companies in New York, but not all of them offer top-notch transportation services. NY Trolley is one of the best you can hire for a city tour, pub crawl, or even a party. The New York Trolley Company offers you the most unique and fun transportation option in NYC. 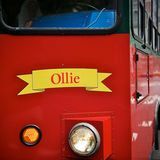 They provide charter trolley rentals for any occasion - weddings, birthdays, pub crawls, bachelorette parties, party bus, event transportation, corporate charters, and much more. Or if you have your own idea for celebrating whether itâ&#x20AC;&#x2122;s a pizza crawl or taco restaurant celebration, we can accomodate you. The clean, comfortable and intimate interior setup of the trolleys provides for a sociable environment, conducive to conversation and fun! Rather than using a limo service or bus rental, their unique and nostalgic trolleys stand out in the streets. Rent a trolley in New York City today and enjoy riding around the city in style. 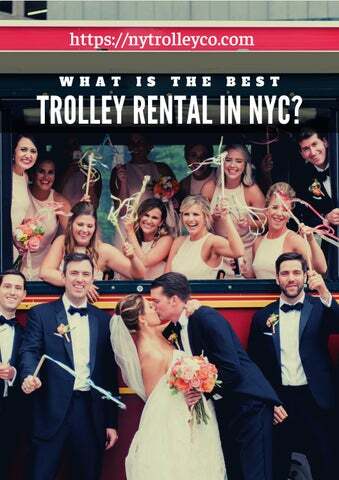 Here’s why NY Trolley is the best party bus in NYC 1. Alcohol Thie trolleys are BYOB so you can bring whatever you like onboard - wine, beer, hard liquor, your choice! 2. Celebrate in Your Own Way Celebrate in the bus however you want! Their trolleys are partyfriendly. 3. Explore The City New to New York? Don’t worry! Get all your colleagues together on their party bus and explore every part of the city. 4. Ride to an Event Their transportation charter bus is the perfect way to get where you’re going on time and in style. Ride with the best NY Trolley has been transporting people for 10 years. They are known throughout the industry for providing the best customer service with professional drivers. They always go the extra mile to make sure your trip is perfect and memorable. When you rent a trolley with them, you can be sure that you getting the best, topnotch service possible which sets them apart from other bus rental companies in New York City!